Alpha Male Tea Party have made their new track The Museum Of Walking available to stream exclusively with Prog. 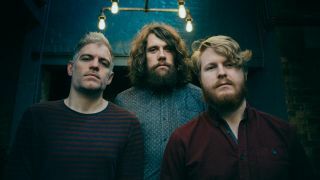 The song is taken from the Liverpool trio’s upcoming album Health, which will launch on June 23 via Big Scary Monsters Recordings. Bassist Ben Griffiths tells Prog: “I’m utterly hopeless with words, which is one of the many, many reasons we’re an instrumental band. In addition, Alpha Male Tea Party will head out on the road across the UK in June in support of the follow-up to 2014’s Droids. They’ll also play a set at Bristol’s ArcTanGent festival on August 18. Find the tour dates, album artwork and tracklist below. Health is now available for pre-order. Watch explosive lyric video for Ayreon’s Run! Apocalypse! Run! Have You Ever Seen Milk?